Lounge comfortably during picnics, camping, hiking or even in the backyard without going through the complex process of setting up a hammock, specially the mosquito net part, while also ensuring better protection against mosquitoes & pests, and significantly improved comfort. ORDER NOW & Get this Camping Hammock with Bug Net Delivered to you in Just 3-5 Days! EASY SETUP & ADJUSTMENT - Comes with 2 x 10 ft high-strength hammock straps & 2 carabiners with snag-free wire gates, which allow even a newbie or least prepared camper to set it up conveniently - unlike ropes the straps arrangement doesn't require tying up of knots, and also proves to be a more tree-friendly solution as these don't damage the bark as well. Moreover, the carabiners are lightweight (just 20 grams), and each strap comes with 16 loops for easy adjustments. INSTANT MOSQUITO NET HAMMOCK - Set up your hammock with mosquito net in a breeze and without any hassle or frustration - the innovative tunnel-shaped mosquito net is smartly integrated to the hammock such that it doesn't require laborious tying to multiple points which is the case with a traditional camping hammock, and wherein you end up ripping apart the net easily even if you make a little mistake. SUPERIOR PROTECTION & HIGHLY BREATHABILITY - The micro-mesh design of our Jungle Hammock allows high breathability, protects against rough winds by alleviating the effect, and helps you feel cosy & warm as if you were sleeping in a small house, just more closer to the nature. Our hammock prevents you from flying insects, creeping bugs, snakes, and other pests too. PREMIUM BUILD & CARRY BAG - Made from extra lightweight yet heavy-duty parachute nylon material, our mosquito hammock is ultra-durable and easy to carry along. It could be easily folded back into its built-in carry bag. Don't want the mosquito net for it's amazing out there? No worries! Simply open a button, pull out the frame from the tube, and turn the hammock 180° for using it without the net - as simple as that. GUARANTEE - With our 100% RISK-FREE SATISFACTION GUARANTEE, you have got nothing to lose. However, we are quite sure that you will be super impressed with its functional effectiveness, easy to use design & the fact that a smooth zipper allows you to effortlessly slip into the mosquito net and come out. 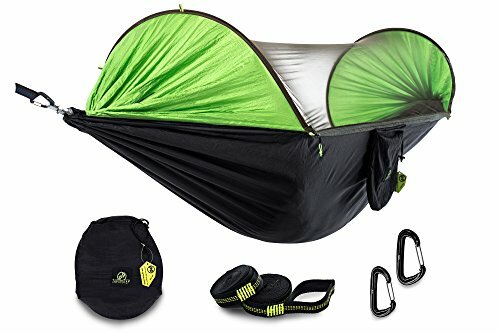 Use it during camping, hiking, picnics, backyards, or other outdoor adventures - you can expect it to be ready for use under a minute - certainly the best hammock bug net. If you have any questions about this product by TAPINSTEP, contact us by completing and submitting the form below. If you are looking for a specif part number, please include it with your message.